Liz Ounanian was only at the Stanley R. Tippett Hospice Home for a brief time, but it made a big impact on her husband, Harding Ounanian, Jr.
"I think it's the best thing I did for Liz after she became ill. I had never been to the house before. When I came in, it was very warm, very inviting. The staff welcomed us. They provided a sense of dignity for her final hours, which was so important," said Harding. 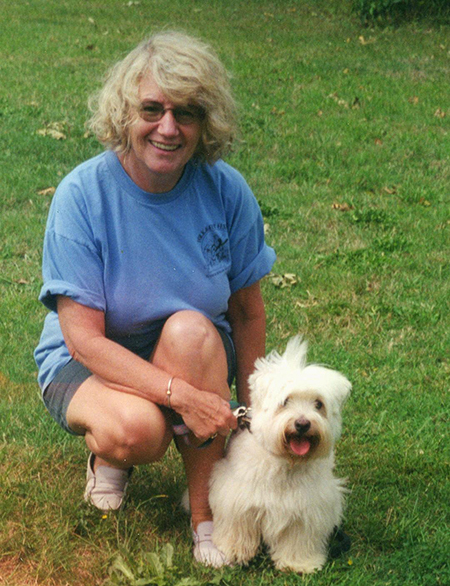 Liz (pictured with her dog, Mollie) and Harding had been married more than 30 years. He described Liz as "very much an outdoorsy woman." The couple hiked the Grand Canyon and Zion National Park, summitted Ben Nevis in Scotland, and visited about 16 national parks in the United States and abroad. When they first met, Liz worked as an administrator at a Boston law firm, and Harding as a writer for a Boston advertising agency. When Liz learned she had breast cancer, she underwent chemotherapy, a mastectomy, radiation, reconstructive surgery, and more tests before finally being declared cancer-free. But the cancer returned four years later, and chemotherapy was no longer effective. The Ounanians initially turned to VNA Care for specialized pain and symptom management known as palliative care. A nurse visited Liz at home twice each week. If Liz's condition worsened, she could smoothly transition to VNA Care's hospice program, which provides physical, emotional, social, practical, and spiritual support for terminally ill individuals and their loved ones. Hospice care is provided at home and at VNA Care's hospice residences in Cambridge, Needham, and Worcester. Liz eventually began lapsing into bouts of unconsciousness. Since it was difficult to care for her safely and effectively at home, Harding moved Liz to the Tippett Home in Needham. "She received outstanding care from the nurses and staff. Though she never regained her full consciousness, she had visitors, and staff made sure she and I were comfortable," remembered Harding. Liz passed away peacefully on Jan. 1, 2010, Harding's birthday. The experience stayed with Harding. Four years later, he found himself in a conversation with a member of VNA Care's Fund Development staff about the exceptional care he and Liz received. Wanting to give back, he joined the Needham Area Community Cabinet to raise awareness of and charitable support for the Tippett Home. An avid gardener, Harding also took on a volunteer position at the home to share his love of nature. His beautiful floral arrangements can be seen throughout the home and bring joy to patients and guests. Harding said, "I look at the Tippett Home as more of a place of peace, calmness, and friendliness. All guests and their visitors are treated as individuals and are on a first name basis with nurses and attendants. Staff are aware of guests' background and can lend more personalized care. A steady stream of volunteers delivers meals to rooms, sit and talk with guests, take care of laundry and chores, garden, and do whatever is called upon." He added, "Though none of us like to think that we might wind up at the Tippett Home, it is extremely reassuring that it's here and ready to serve."